A shiny 6 inch bangle is a perfect gift for a young girl age 5-8 years old. This round bangle is beautifully crafted with fine 10k yellow gold and lovely designed with a diamond cut accent that shimmers up the piece to spectacular levels and gives it a simple yet elegant look. The lightweight bangle does not contain a hinge which would eliminate the smooth shine, instead it can be put on the wrist due to its flexibility and closes with a quality security safety clasp. Although fine gold pieces are delicate our great quality insures a lifetime use when properly cared for. 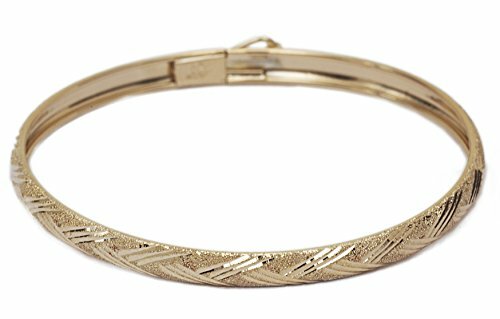 To keep this shimmering bangle shining and scratch-free, avoid contact with chlorine and other harsh chemicals. Do not wear jewelry during rough work and be sure to store it in a fabric-lined jewelry box or pouch. To clean gold jewelry, use warm water, a mild soap, and a soft cloth, if needed. If you have any questions about this product by SL Kids Collection, contact us by completing and submitting the form below. If you are looking for a specif part number, please include it with your message.